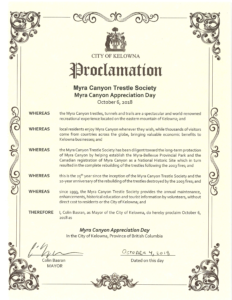 The City of Kelowna has Proclaimed October 6th, 2018 as Myra Canyon Trestle Society and Myra Canyon Appreciation Day. A massive THANK YOU to all the members, volunteers and friends of Myra Canyon for all their work and support over the past 25 years. ← Previous Previous post: Preparing the Myra Canyon garden for 2019! !